Picture from group : The Paps East and its southern tail to the right. Picture: The Paps East and its southern tail to the right. Steep pull up rewarded by fine views. 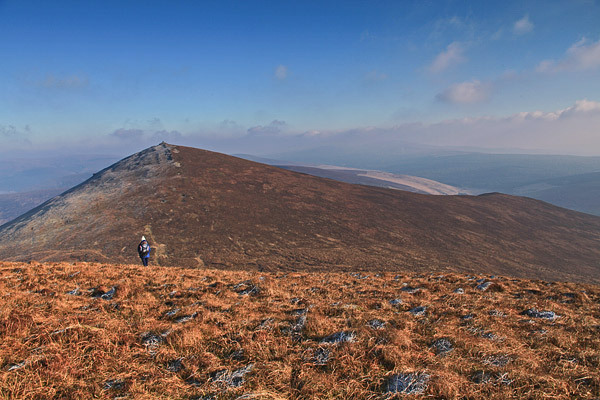 This is the east of the two Paps, the most shapely pair of summits in Ireland. One good approach is from the Duhallow valley at around W14304 85244 A. There are a number of tracks, not totally consistent, that can be found that will take you through the steep heather covered lower slopes to the higher ground which has lower vegetation cover. It is possible to park to the north on the Rathmore side at W1475 8687 B or to the south, Clydagh Valley side, at W14446 84029 C.
Another way of reaching the summit is from the West Pap. The summit itself has great views of the West Pap and a ridge of over 1km descending due south. There are also views towards particulary the Derrynasaggarts to the East. The East and West Paps are on almost an exact east west line, have very similar shapes when viewed from most angles except south and are only around 4m different in height.